From the end of the Second World War until the rise of Gorbachev, the churches in the two halves of a divided Europe might have been living in different worlds. . . . Almost all had to adapt to declining congregations, new concerns about women’s role in religion, and changing attitudes to abortion, contraception, and divorce. Yet the Eastern churches, undermined by state control, savage ideological attacks, show trials, and sometimes physical violence, still managed to support resistance movements, for example, the Polish priests who supported Solidarity. In the West, by contrast, tradition—the great monastic orders, the language of the liturgy, pilgrimages to saints’ shrines—was weakened by the fierce winds of secularization; only the charismatic movement proved astonishingly successful. All this is surveyed in the concluding volume of the Penguin History of the Church. The series starts with the first Disciples; it ends in the late twentieth century—with Christians struggling to face up to fresh global challenges and opportunities. 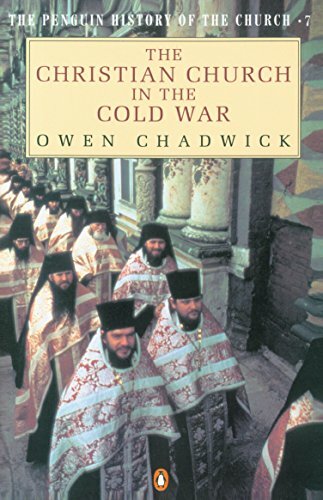 Reverend Owen Chadwick (1916-2015) was one of the foremost historians of church history. Reverend Chadwick's many notable publications include The Victorian Church, Victorian Miniature, and The Secularisation of the European Mind in the 19th Century. He was a Regius Professor of Modern History at Cambridge University, where he was also Vice-Chancellor. He was an ordained Anglican priest and academic whose writing on Christianity was known for being both scholarly and entertaining. "This short monograph surveys church history in Eastern and Western Europe from WW II to the present. . . . A useful introduction to the complexities of church history in contemporary Europe from the pen of a distinguished British historian."